Pushkar, the city in Rajasthan is a sacred town for the Hindus. This town is situated about 11 km from Ajmer and has such a wonderful charm that made the famous Indian poet Kalidas feel enchanted by the beauty of the place. Even the great Hindu epics Ramayana and Mahabharata give reference to this wonderful place as Adi Tirtha. There is a legend that Lord Brahma created this lake where he performed a sacrifice on a full moon day hallowing the place. The city also takes pride in the large number of temples dedicated to him. We at Touristplacesinindia.com provide you with complete information on all that you want to know about Pushkar Lake in Rajasthan. Varah temple: This temple which is now in the ruins was built in the 12th Century AD was destroyed by Mughal Emperor Aurangzeb. This temple was reconstructed in 1727 by Raja Sawai Jai Singh II of Jaipur. Mahadeva Temple: It is a beautiful 19th Century temple which is noted for its beautiful marble image of Lord Mahadeva with five faces. The temple is remarkable for its structure and the ornate interiors. Ramavaikuntha temple: It is one of the largest temples in Pushkar, which was built in 1920s and boasts of having sculptured images of 361 deities. Lake and its Ghats: There are many Ghats ( bathing platforms ) surrounding this holy lake where the pilgrims take their holy dip. It is said that the famed water of this lake washes away the sins that a person has performed during his lifetime. The water of this lake is also said to cure skin diseases. 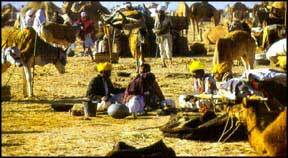 A major event in this city is the Pushkar Fair which is held in the month of November every year. This fair brings the villagers from the harsh and arid desert life to the dazzling style and colors of the state. It is said to be an unparalleled and unforgettable experience for the tourists who are first time visitors.